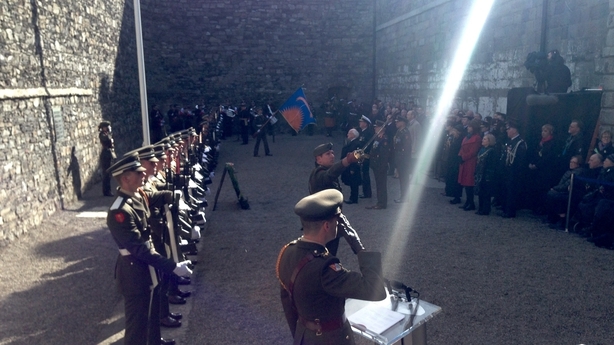 Wreath-laying ceremonies followed at Glasnevin Cemetery and at the Stonebreakers' Yard in Kilmainham Gaol. The parade then made its way from St Stephen's Green to College Green, stopping off at Dublin Castle. After a minute's silence was observed, the flag was raised to full mast and the national anthem was played while the Air Corps conducted a fly past. Dignitaries at the event included former presidents Mary McAleese and Mary Robinson, former taoisigh Bertie Ahern and Brian Cowen, Dublin Lord Mayor Críona Ní Dhálaigh as well as Northern Ireland Deputy First Minister Martin McGuinness, Garda chief Nóirín O'Sullivan and the British ambassador to Ireland Dominick Chilcott. The parade saw 3,700 members of the Defence Forces, gardaí and the emergency services march along a 4.5km route from St Stephen's Green, past the GPO to Capel Street. As part of the main ceremony, children representing the four provinces of Ireland laid daffodils under the portico of the GPO as a lone piper played Down By The Salley Gardens. Fr Seamus Madigan, head chaplain of Defence Forces, said the flower-laying was a "symbol of the unshakeable resolve to live together on this island in peace and harmony". A free, open-air concert, titled A Nation's Voice, took place at Collins Barracks this afternoon. Over 1,100 voices from 31 choirs and 18 counties from Cork to Donegal joined the RTÉ National Symphony Orchestra and conductor David Brophy in the performance. The concert was presented by Miriam O'Callaghan and drew thousands of people. Earlier, organisers of today's events warned of massive demand for public transport and access to the city, but with trams not running due to a strike by Luas workers the capital faced unprecedented demand for bus, Dart and taxi use. Iarnród Éireann said 50,000 people used their services to travel into the city centre to view the parade, with Dart and commuter trains from Maynooth and Drogheda particularly busy. Dublin Bus said its services were very busy this morning between 8.30am and 9.30am but the extra capacity of 600 buses was well able to cope. Tomorrow, RTÉ will host a major cultural event, Reflecting the Rising, featuring exhibitions, debates, and performances throughout the city centre. 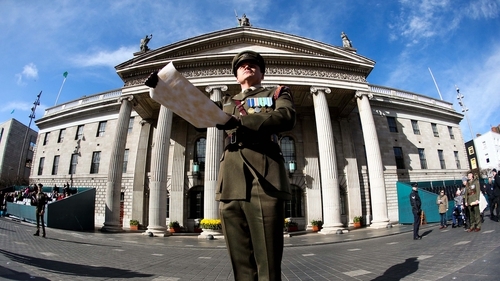 Marking Easter Monday, further commemorations are planned at each of the seven key battlefield sites in Dublin. Wreath-laying ceremonies, again open to the public, will take place at the 1916 garrisons including Boland's Mill, the Jacob's Factory on Bishop Street, Dublin Castle and City Hall, the Four Courts, the Royal College of Surgeons, Moore Street and at St James's Hospital, which was the South Dublin Union 100 years ago. Outside of Dublin, simultaneous wreath-laying ceremonies will be held in: Athenry, Co Galway; Cork; Enniscorthy, Co Wexford and Ashbourne, Co Meath. Also tomorrow, cultural events are planned in more than 200 venues across Dublin city centre including 500 free talks, exhibitions, debates, film screenings, performances and dramatisations, with six outdoor stages and lots of activities for children and families.